Worst-ever use of an Einstein quote? The U.S. Department of Health and Human Services has an Office of Research Integrity responsible for investigating cases of possible scientific misconduct, among other responsibilities. 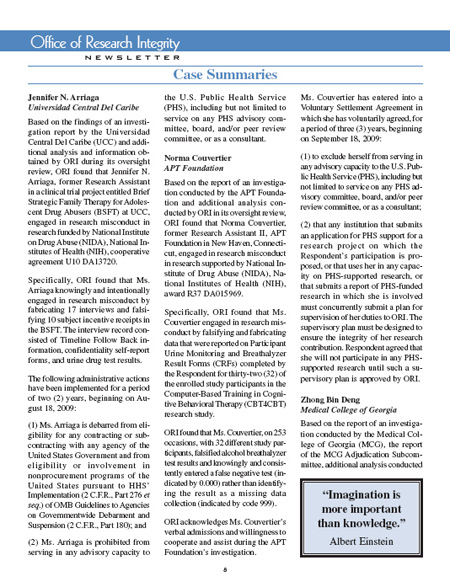 In its December 2009 newsletter (a PDF file), the ORI summarizes several recent misconduct cases, beginning on page 8. In general, these cases involved researchers who altered data to make them look better and/or invented data that they did not have. Presumably the message that ORI wants us to absorb from these case summaries is that such inventive approaches to data collection are unacceptable and will be punished harshly. Then why, at the bottom of page 8, does the newsletter include a “pull quote” box containing the famous Albert Einstein observation that “Imagination is more important than knowledge”? In this context, how can that quote NOT be interpreted as a defense of the offending researchers? Instead of the Einstein quote, they should've reprinted one of my favorite Sydney Harris cartoons. It depicts Galileo dropping two balls from the top of the Leaning Tower of Pisa. The big ball is falling faster than the small one. Galileo thinks to himself "It shouldn't happen that way–I'll have to alter the data."